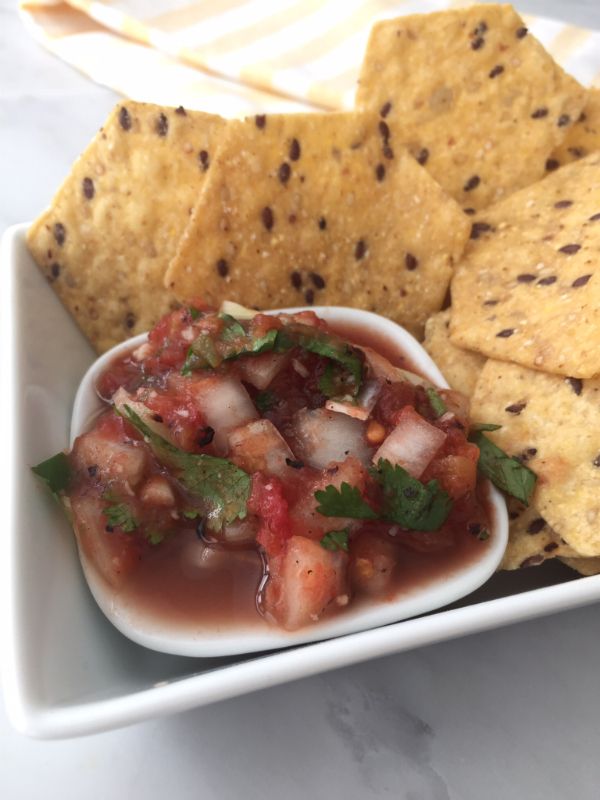 Our friends had us over this week for a barbecue and one of the appies they served was fresh, fire roasted salsa with tortilla chips! I couldn’t get enough of it! It was so fresh, and had the perfect amount of spice. I knew it was a winner when I saw Mac go back from more salsa and chips instead of a second helping of dessert! Sarah let me help her prepare the salsa which I loved because I learned how to make it. She went from memory, so I knew the groceries to pick up and she filled in the blanks by text so I could make it at home. It’s full of simple, fresh ingredients and it’s super easy and quick to whip up. Cut jalapeno peppers in half. If you prefer a milder salsa, remove ribs and seeds. Add olive oil, jalapenos and cloves of garlic to frying pan. Heat on medium heat, stirring until jalapenos and garlic cloves are charred. A strong odor may come off the peppers, so make sure that there is good ventilation. 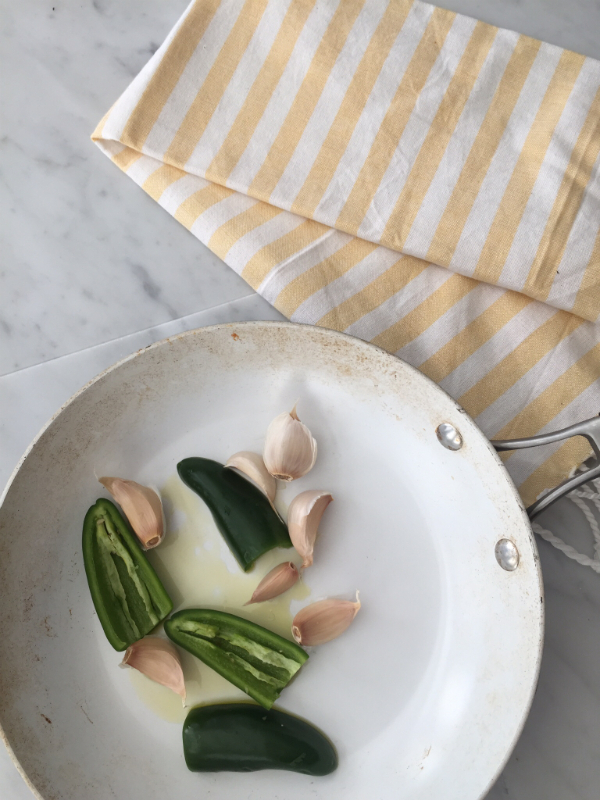 Let peppers and garlic cool slightly and peel skin off garlic and put in blender. Blender together until minced well. Add fire roasted tomatoes and pulse in blender until it's coarsely mixed (do not puree). 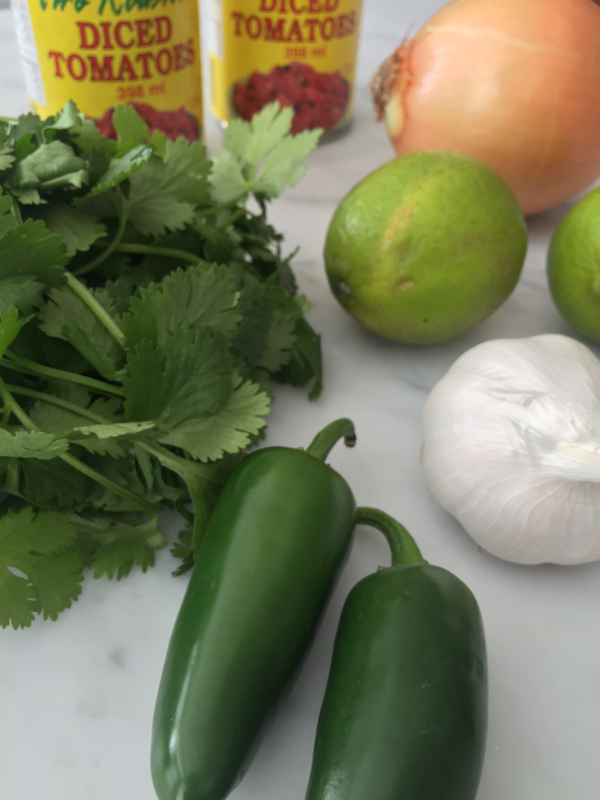 In a bowl, stir together mixture from blender, shopped cilantro, diced onions, lime juice and salt. 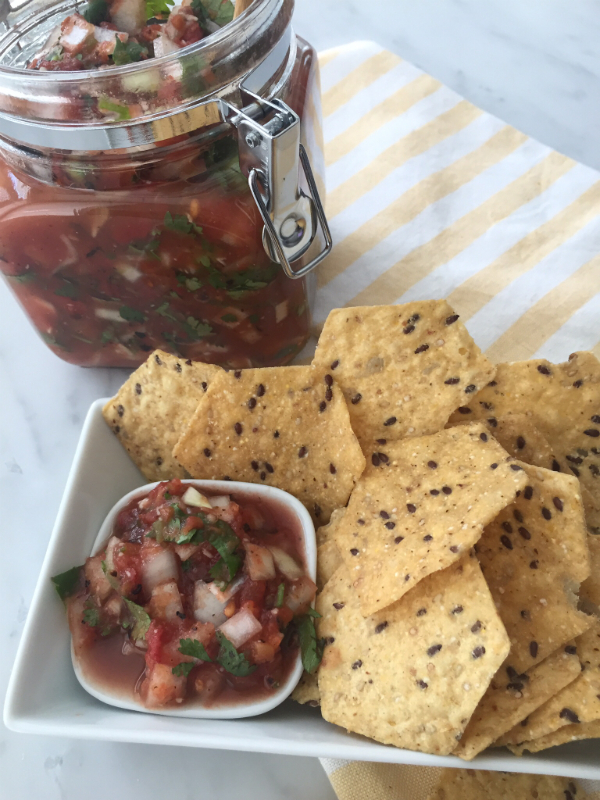 You can easily adjust the level of heat of this salsa. I removed the ribs and seeds from the jalapenos before charring them as my family likes a medium salsa. For more zip, just cut the jalapenos in half, leaving them as is. 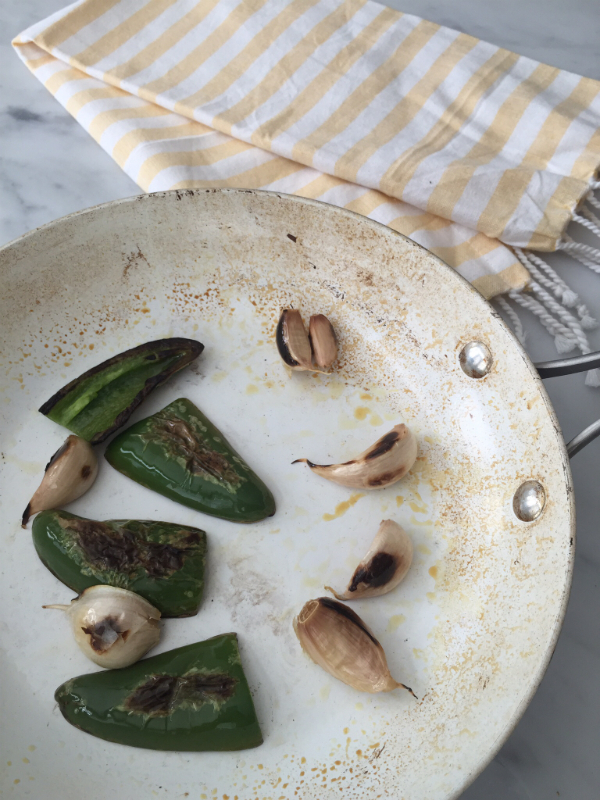 As you are charring the peppers and garlic a strong odor will come off the pan. Make sure to have your stove fan going and you may want to open up some windows, but trust me…the end result is worth it! 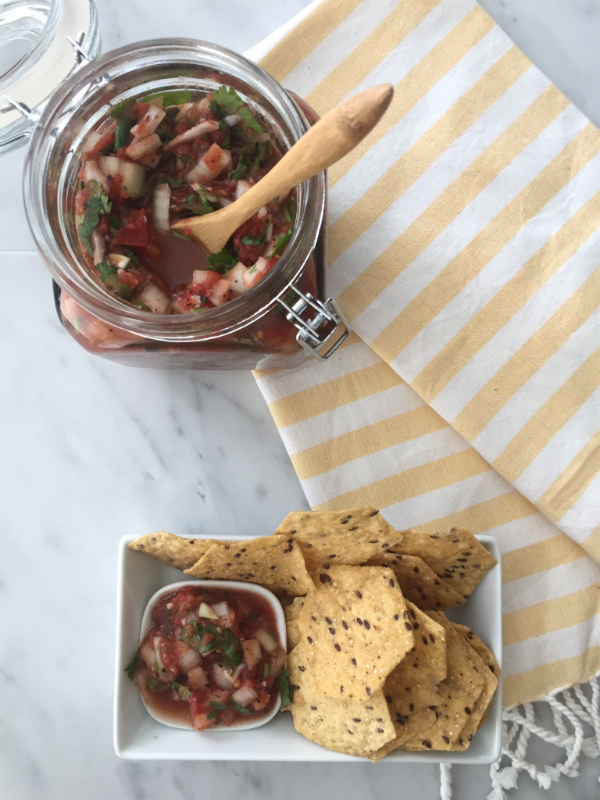 This salsa is super healthy is a great with tortilla chips. I love it with Food Should Taste Good Tortilla Chips. 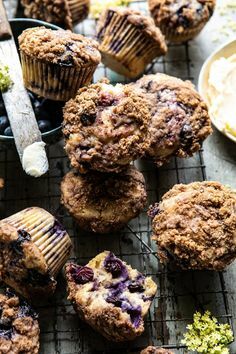 They are non GMO, vegan, low sodium and gluten free…so, I feel a little less guilty! It’s also amazing on taco salad and would be a healthy topping for chicken.